UKOKKEI RAMEN RON – One of the Best Shoyu Ramen in Manila! Ukokkei Ramen Ron serves the best shoyu ramen in town! I got this tip from my Japanese foodie friend, Atsushi Matsuura. 1. The Ramen is not available for take-out. You can only enjoy it in the restaurant. There is NO dessert in Ukokkei Ramen Ron. RAMEN DAISHO UKKOKEI: Hakata Tonkatsu Ramen and Yakibuta Chahan! TAMPOPO たんぽぽ: Deluxe Black Pig Shabu Ramen and Top Grade Black Pig Tonkatsu! IKKORYU FUKUOKA RAMEN Philippines’ Black Garlic Tonkotsu Ramen! RAMEN SANTOUKA PHILIPPINES: Legendary Hokkaido Ramen now in Manila! RAMEN YUSHOKEN: Guide to the Best Ramen House in the South! MITSUYADO SEI-MEN’s Double Cheese Sauce Tsukemen! UCC’s Tan Tan Mian Tonkotsu Ramen! 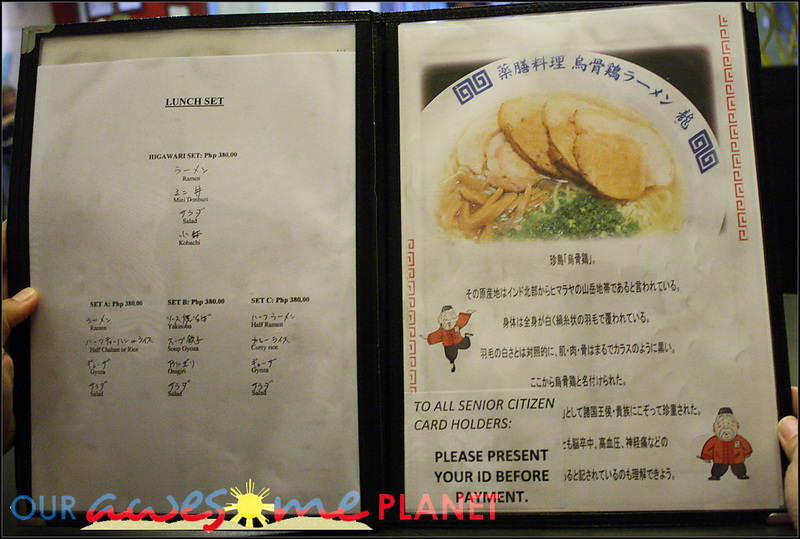 RAMEN BAR – One of the Best Authentic Japanese Ramen Places in Manila? Ukokkei Shoyu Koumi (P330 + 5% S.C.) Beef Ramen with Shoyu Sauce. Savor the smell of the ramen and look at the glittering oil before eating it. There are three types of Ramen: Shoyu (soy-sauce based), Shio (salt based) and Miso (Miso soup based). You can have it hot or cold. In Ron, we would highly recommend ordering the Shoyu Ramen. Most of the ramen would have this sesame oily taste. The shoyu taste is smooth and clean like swimming in Kayangan Lake in Coron. I like the way the ramen noodles are cooked al dente. It is fatter than most of the commercialized ramen houses in Manila. The miso based ramen did not leave a good impression on us. The best time to go is during lunch time. 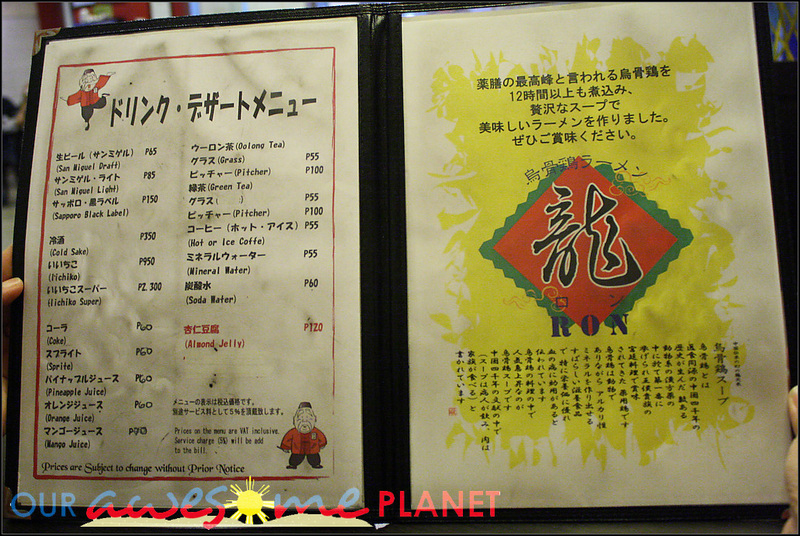 They have a set lunch menu (P380) of Ramen, Mini Donburi, Salad and Kobachi. Order the ones with gyoza and rice. 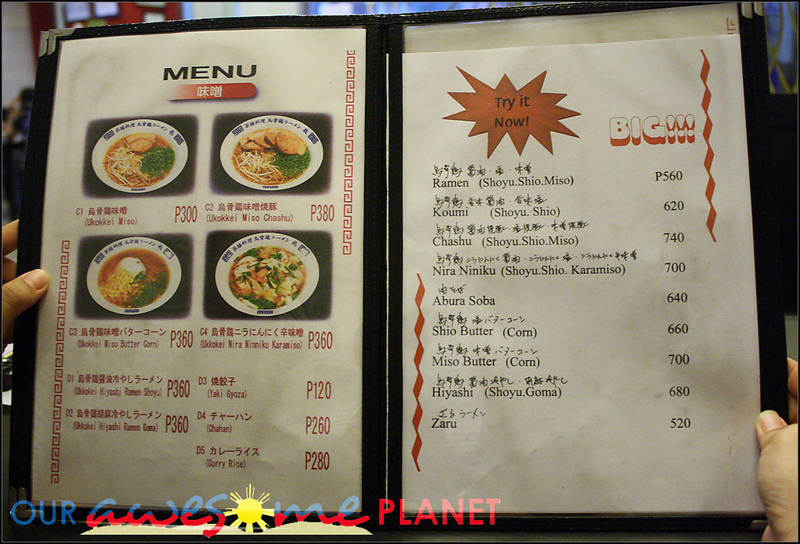 During dinner time, the ramen is usually priced individually at P300-P360. Ukokkei Nirra Niniku Karamiso (P360 + 5% S.C.) Vegetable Ramen with Miso Sauce. Ukokkei Ramen Ron has a simple modern japanese interiors with a ramen and bowl display as the highlight. I like the Japanese tables where you leave your shoes before sitting on a thin seat cushion and letting your feet hang and swing around. Gyoza (P120). This was gone in seconds. Eating gyoza is the best way to start your meal. We heard that Shinjuku serves the best gyoza in town. What is your favorite Japanese Restaurant in Manila? 822 A. Arnaiz Ave. (Pasay Road), Makati. In between Paseo de Roxas and Amorsolo St. Text and Photos by Anton Diaz. 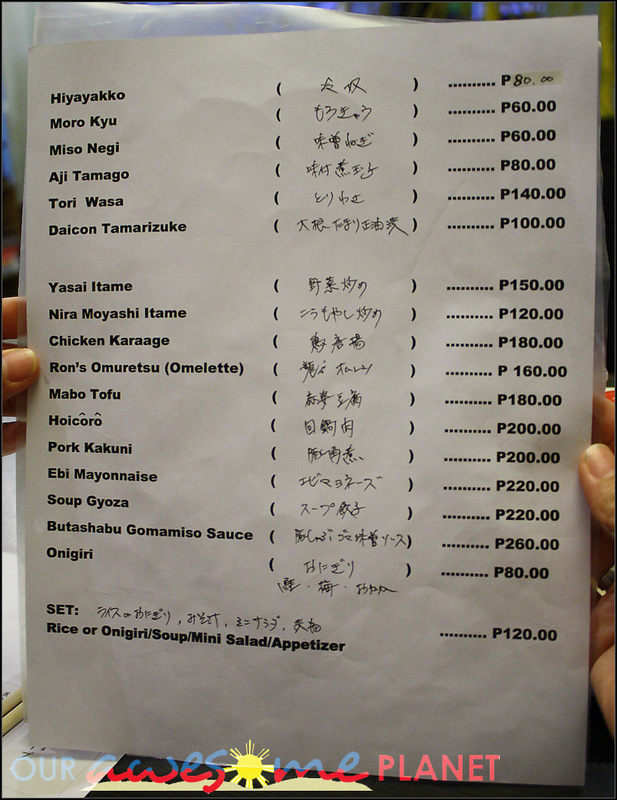 Copyright 2008.
thank you so much for this tip, my hubby and i have been looking for real good ramen here in manila. after trying the authentic ones in tokyo, its really never the same…..i cant wait to try this place out! what’s up with the no sharing rule? :S i hate it when restaurants tell you what you can and can’t do! This is great,my hubby loves Ramen!!! Try Maruchan, just across Kikufuji in little Tokyo. I find their chasyu ramen to be the best in town. For yakiniku, try Gyumon its a small restaurant beside Zango in Amorsolo. They serve the best Wagyu yakiniku. Try SERYNA ( tel no 894 3855 ) in Little Tokyo, right across Plaza Fair/Makati Cinema Square. Best time to go is lunch for their set lunch at P380 yata. Rice, salad, slices of orange, main course, etc. : ) We always have our board meetings there. But go 11.40AM or before 12Noon. Open Saturdays and Sundays. Park in the basement of MCS. 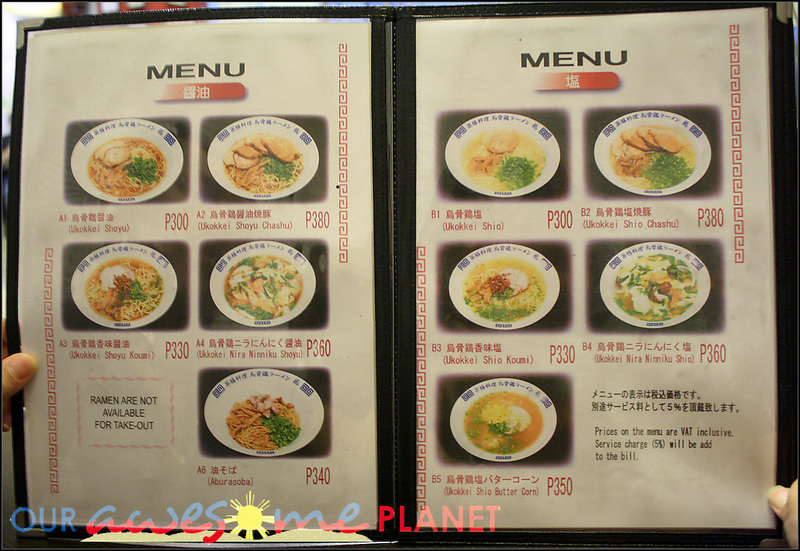 Our personal favorite for ramen is Shinjuku Ramen House on Makati Avenue. There’s one that’s served with a thick sauce and minced pork/chives on top. However, other noodle dishes are just as good. Their gyoza is pretty hard to beat as well. Good serving size and very reasonably priced. As for other Japanese restos, Zensho on Tomas Morato is our current fave because they have an order all you can buffet for lunch and dinner and the food is prepared to order, not ahead of time for the most part. Noteworthy are the beef teppanyaki, the cuttlefish teppanyaki, sauteed mushrooms with tofu… I believe the lunch buffet costs P595 while dinner costs either P695 or P795 per person. For the quality, quantity and breadth of choice, this one’s a winner. we love eating ramen here at ukkokei! even the lunch meals – love the gyoza and the fried rice. as my brother shouts whenever we are parking outside the place – ukkokei ramen chow! I have eaten here several times. The staff is extremely rude – it is as if they have a “don’t socialize” policy. When you ask questions they hesitantly try to answer with the “why the hell are you asking” look. I have eaten here many times though because the food is really good. The ramen is exceptional I think the best I have had in the Philippines. It IS oily though and I am surprised of the intense flavor that they may put MSG. (not sure) Whatever it is it is REALLY GOOD RAMEN. Don’t expect any good service. I go in and just eat. If there is a better ramen place please let me know and I would gladly move restaurants. I prefer the gyoza in Ukkokei. Its so much better than Shinjuku’s. Our family went to have a early lunch around 11am. But our food was serve after they served all their japanese customer first( That’s three table even we’re the first came in). I like their ramen but after the incident, i wont go back to that restaurant. they are the most child-unfriendly restaurant ever. would you know how i can file a complaint against their waitress and bad service? you can share 2 bowls over 2 people.. but they dont like it you share 1 bowl over 2 or more people. ramen are not really meant for sharing..
theres no other better ramen place in manila now.. so we just have to live with it. although i havent gotten any bad service from them so far. except got turn down a few times bec they ran out of soup. sure, maybe you’ve been in and out of japan (but because this is the internet, we can only take your word for it). and even though you’ve been in and out of japan, the fact that everyone else says it’s good makes me believe that maybe they are good. …and that maybe you just didn’t like the place because of how the staff treated you. fine, the staff should have been a little more polite, but maybe you guys should have been a little more polite too. there’s no excuse for a child running around a restaurant. discipline your kid. it can be done. one of mine, and civilised society’s biggest pet peeves is a rowdy kid bratting out in the middle of a restaurant. yeah, it’s not the kid’s fault, it’s the parent’s fault. control your kid, man. secondly, even if you mom lightly placed her shoes on a “no shoe zone” then she was being impolite. doing that is considered very impolite in japanese culture. you should know this having been in and out of japan since you were 4. so in a way, your mom was rude to them. they just pointed it out. if you want to be treated with respect by the restaurant, then respect the establishment as well. it’s a two way street. indeed, shinjuku has the best gyoza. fat and juicy. yum! shinjuku has bad service too. impolite staff. we were asking for complimentary tea and one of their female staff gave us a “what now” look. Is it a trend in Japanese restaurants? Please remember that customers are ALWAYS right. The food was unsatisfactory for all of her family, not just herself. So they have the right to complain and be heard. I love ramen. And I’ve been to Japan more than half a dozen times (my brother-in-law is Japanese). I’ve eaten in Ukkokei with my brother-in-law, and honestly, all of us thought the food isn’t that good… at best, average. People calling it the best ramen place is definitely exaggerating. Or they just haven’t tried other places. Probably it’s the only ramen house they’ve ever visited, so technically they can call it the best since they don’t have any basis for comparison. And no one should blame a kid for being a kid. No one has the right to dictate how a parent should discipline their kid. A door is for going in and out, so what the kid is doing is normal. Jumping is normal. What’s wrong with jumping? The blogger’s kid was on their side of the table and not bothering anyone, so there is no need to control him. I don’t see what one of the above commentator’s problem is. If a restaurant feels that it cannot tolerate kids acting as kids, then they should have a no-kid-policy in place. I beg to disagree with mrs.awesome planet and hurray for sassy and sara! Had such a bad experience with this restaurant!! I got really disappointed with the pork ramen thats all fat and the service was really rude! Very arrogant japanese owner!!! Why pay 380 pesos per bowl to be treated with such rudeness! Even though they have tasty ramen, once you experience the service, you will lose your appetite with their no care attitude! Overrated place. My family and I had better ramen in our old Japanese resto and in our visits to Tokyo. worst service ever but the best ramen in town! i don’t know about you guys but i go there for the food and not the special treatment. i can care less if they are rude, disrespectful to me or even curse me out – as long as they don’t spit in my food i’ll be back for more. in fact just talking about it makes me want to go there for dinner right now. i love to eat here because other ramen spots simply cannot compare to the taste of ukkokei. also to the other comments defending the spoiled brat… learn to discipline your kid. The service here is just bad. The staff were very rude as mentioned by a lot of people. Even if their ramen was fine I will never go back here. I think they are overrated. Just head to the other Ramen restaurants in Makati. However, I don’t support the parent with the noisy kid. If you are in a public place please discipline your kids and think about the other people in the restaurant. You are not the only customers. But I wasn’t there so I really don’t know how noisy this kid was. Everyone deserve good food and good service, especially if they apply a service charge. you forgot to mention Tantanmen. Or maybe you missed it because it is not on the menu. It is their secret recipe. I think they only serve 30 bowls per day. it’s good and authentic. best ramen in ph so far. I go here for the Tantanmien. It’s not on their menu but it’s definitely the best ramen in town. Richer in taste compared to the others.